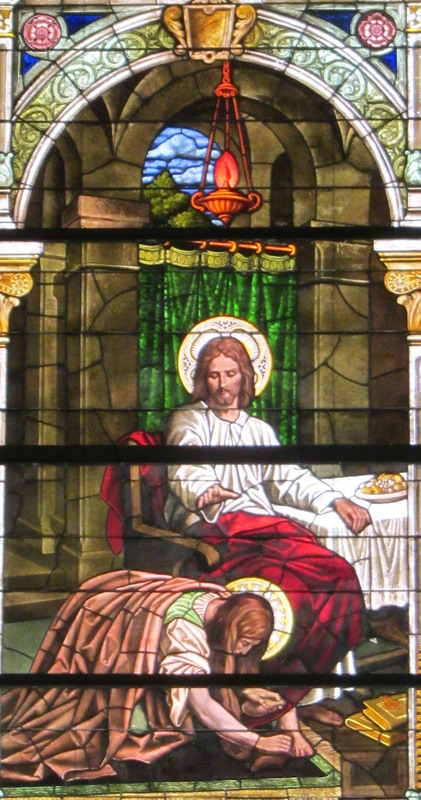 Welcome to my blog of stained glass in Kansas City’s churches and other religious institutions. Stained glass has enriched our places of worship for centuries. People have been moved by the beauty of these unique creations and by the spiritual ideas conveyed through their images. The Kansas City metropolitan area offers exceedingly diverse examples of religiously inspired windows in churches, synagogues and other institutions. These windows reflect our varied religious traditions as well as changes in social and aesthetic values from the earliest periods of our city’s history until the present. They form an important part of our cultural, architectural, and social history. Unfortunately many of our community’s stained glass windows may not be easily accessible. They are only viewable in situ, and since institutions are frequently locked when services are not being held, this often renders casual viewing difficult and inconvenient. When viewed in situ it is often difficult, if not impossible, to see all the detail which stained glass windows have to offer. Furthermore, many of us rarely enter religious institutions other than our own, and even the windows with which we are most familiar may become background to our common habits of worship and church attendance. Our community’s rich heritage of stained glass windows provides us with many outstanding examples of spiritual expression for us to study and appreciate. These windows document important aspects of our community’s architectural and social history extending from the late 18th century to the present. As we discover how different communities in different periods have been inspired to create these windows, we can learn more about our own cultural traditions while gaining deeper insight into the spiritual traditions of others. This blog (and the website under development) will document our community’s rich heritage of religiously inspired stained glass windows, provide viewers with information about the institutions where the windows are located, the designers and makers of the windows, the historic sources of the image s, the dedicatees and donors of the windows, and the historical and scriptural content of each of the windows. It will provide a resource for education, research and a deeper appreciation of the outstanding works of art that exist throughout our community. My intention is to include photographs of most of the windows in the institutions I discuss, as well as more detailed images of many of the windows whenever possible. I intend to make this registry comprehensive and inclusive of religious institutions throughout the Kansas City metropolitan area. As time goes on, I hope the collection will be searchable according to several elements such as makers’ and designers’ names, significant content or subject matter, scriptural sources, etc. Visitors will be able to locate examples of works by leading artists and glassmakers and to compare the treatment of similar themes as envisioned by glass artists in different periods or from different religious traditions. I hope you will explore the many locations and other categories this site offers you. In most cases simply “clicking” on an image will bring a larger view of the window up on your screen. The site is just getting constructed, so watch as we experiment with different “Themes” and ways of organizing and presenting photos and information about our magnificent resource of Inspired glass in Kansas City’s religious institutions. Bruce…Totally enjoy your enthusiasm for stained glass. I have been in the business for over 40 years. The Stained Glass Assoc of America is the paternal organization of the industry since 1903 and is headquartered in Raytown. Contract Katei Gross (stainedglass.org) for a wealth of archives. Bruce, I enjoy your blog! I was fortunate to have photographed the stained glass windows of the St. Martins Cathedral in Bratislava, Slovakia. Two of the pictures were featured in a book about the Music played in the cathedral. I also want to thank you for your comments on the “Hot Off The Press” blog that featured my photo of a man reading a book while walking down the street. Take Care. I find going through this meditative and even prayerful. What a gift your work is, Bruce! Love your blog! I went to Holy Name Catholic school in KCK from kindergarten to 7th grade, and our Church has the exact same stained glass windows as Our Lady of Good Counsel. The article on those was great and so are all of your pictures. Please keep doing what you do! Bruce, great photos; thanks for posting them. Hi Bruce! Just wanted to let you know that I was recently nominated for the Blogger Recognition Award and in turn was encouraged to nominate others whom I feel worthy. I don’t read many blogs because life is quite crazy with school and writing, but your blog is one that I do read. I always enjoy learning about the history of the stained glass windows and the photos you share. So, congratulations! You can view you nomination at http://jillprintzenhoff.com/2017/09/19/blogger-recognition-award/. Thanks! Jill, it was so very thoughtful of you to nominate me for this “Award.” I am pleased and honored, especially as I need to get started again blogging and photographing. Your posts are always inspiring and thoughtful. I will add a bit more at your site. Be well. Marty, so glad you visited my blog. Lots to see and read, especially on the “pages.” I haven’t added anything in a while. Stay tuned. More to come. if you “FOLLOW” you will get notified of every added post. Be well. Thanks very much – I am following, and appreciate your beautiful images. Cheers.